LMRA Media release by FR Media. 2011 Jason Moyle in his Rayburn placed 3rd after 2 heat wins and a 3rd put him off outside pole for the feature. Note-able exclusions from the tital were the two Nylander boys, one with driveline issues and the other with engine problems on the night, others were Michael Holmes who had sold both his cars and the two Noakes boys with heavy work comitments, not to forget the other Ultra Tune Morley superstar Jamie Oldfield. All drivers contested time trials as well as three heats each. Simon McNab were able to restart as well as Brad Ludlow after the rules allowed him to change a right rear tyre. On the restart the four lead cars cleared out with Warren Oldfield setting the pace early, from Craig Vosbergen, third and forth had there own race going on with Matt Goodlad in third with Brad Blake working himself into a passing position, around the mid race stage Blake pulled a pass on Goodlad only to be put back after the orange lights were flicked on, Vosbergens luck was much better, after Oldfield had set the early pace he later settled into a more de-fencive race and only lost the lead to Vosbergen one lap prior to the white flag. Based on the exhibition in race-craft that Steve Francis showed last year when he was at Collie Speedway it was always going to be a battle for anyone to beat him, Two more American's for starters Jeremy Payne in the Haliday Racing car, and Steve Casebolt in Peter MacPerson owned car. New South Wales racer Scott MacPherson, a previous title winner in WA failed to make an impression on the field, While some of the West Australia drivers took it up to the impressive line up drivers, Blake, Moyle, Atkinson, Giancola and Watt all won heats, while Holmes and Brad Ludlow each won a dash. Steve Francis and Marc Giancola shared the front row for the A Main, Francis led the field away after what appeared to be a hesitation and hole shot tactic but the race was soon back under the starters control after Jamie Moon spun, The second restart was a mirror of the first, This time the result was a multi-car pile-up right under the Chief Stewards tower, A quick thinking Koran Atkinson jammed on the brakes and spun infield to avoid the carnage, many cars behind him on the pole line managed to avoid damage also, While higher up the track Phil Zuidema ended up on top of Warren Oldfield's car, both these cars would restart, Warren Oldfield would retire shortly after and Phil Zuidema would finish the A Main in ninth, Not so lucky was Nat Muir and Scott McPherson, both cars had to be towed from the race-track, while everybody else involved restarted. Steve Francis would again get the jump over Marc Giancola on the third restart and lead the A Main from start to finish, In the early laps as the drivers settled in Marc Giancola held second with Brad Blake third and Jeremy Payne forth, Steve Casebolt would withdraw at lap five with more problems after starting from the rear, as the race progressed Phil Zuidema, Jay Cardy and Brad Boley would get together and bring on the caution lights again, Marc Giancola was forced to retire while in second position with a drive line problem, Jeremy Payne who had been threatening Brad Blake, eventually made a big outside pass on Brad to take over his second place, Jason Moyle suffered major suspension damage after a spinning lapped car re-entered the race track clipping the rear of Jason's car and causing both car to spin violently and bring on the yellows again, neither car restarted, Craig Vosbergen drove the wheels of his Rocket to advance from his starting position of twelfth to sixth, A further re-start occoured at the three lap from home mark when Alec Melvin collected the wall through turns three and four. In all a successful night for Collie and the teams had only hours to turn these Late Models around for the following night at Redline Speedway in Manjimup. Jason Moyle devastated after a strong qualifying and a creditable top 6 position in the feature when disaster struck. Photo: Jason Sutton. Steve Casebolt & Steve Francis having a chat prior to racing begins. Photo: unknown. A very unselfish Ryan Haliday stepped aside for Jeremy Payne to race the car Photo: Team Halliday. Marc Giancola retired while in second. Photo: LMRA facebook. The Team of Steve Francis and Micheal Holmes prepare after time trials. Photo: unknown. Above - Steve Casebolt dogged by mechanical problems all night. Photo: LMRA facebook. Left - Jamie Oldfield Solid seventh. Photo LMRA facebook. That never say die attitude paid off for Jay Cardy during round three at Collie Speedway, Jay did qualify off the front row on the outside of Craig Vosbergen but seemed to struggle with grip problems, however as the feature went on with about ten to go the new bright blue Cardy car was on a charge. With only a handful of laps to go Craig Vosbergen's lead was schrinking, Craig had encountered lapped traffic that to were racing for track position also, Blake and Cardy were gaining, With no time left Craig was force to run high in the powder hitting the wall in turns three and four and dropping back through the field, Cardy had already passed Blake on the back straight, both Cardy and Blake passed Vosbergen on the inside as well as Michael Holmes to fill the podium. Ryan Halliday after a win in heat 4 and a DNF in heat 1 came out of a 2nd in the B dash to DNF. Friday the 16th of January 2015 would see Collie Speedway host round one of the USA Late Model Invasion Tour. The Collie Racing Drivers Association hosted the 2014 2015 West Australian Late Model Sedan Championship at the Collie Speedway on the 21st of Febuary 2015. 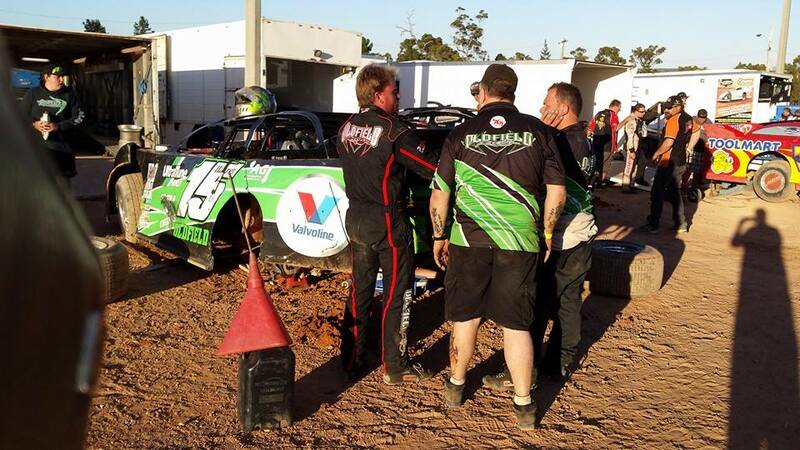 The Collie Racing Drivers Association hosted round five of the West Australian Pro Dirt series on Saturday night the 21st of November 2015. 2015 - 3rd Generation Late Model racer Brent Vosbergen. 2015 - One of the Collie young guns Paul Joss. 2015 - Heat 2 winner Alec Melvin from Collie. 2015 - Rookie Jarrin Bielby finished 2nd in heat 3. 2015 - Jed Rodgers adding more depth to the rookie list. 2015 - Jamie Oldfield takes out round 5 of the WA Late Model Pro Dirt series. Photo: Fastlane Photo's.